Available in e-book format only 8/11/15 from Samhain Publishing! Eliza Terribury is determined to be the first of her sisters to evade her mother’s attempts to shoo her down the aisle. Her novel-writing dreams will wither under the demands placed on a gentleman’s wife.Saddled with his title at a young age, Michael Gerard, the elusive Marquess of Rutherford, has always done his duty, but he will not be pressured into choosing a wife. He just never expected the rush of attraction every time the impertinent young Eliza crosses his path. 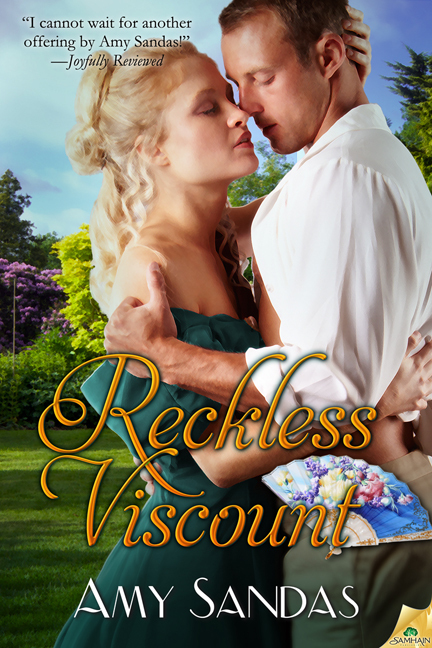 When a completely innocent incident leaves Rutherford’s hands in a compromising position on Eliza’s bare skin, they have no choice but to announce an engagement. Privately, they agree to seek a way out of the unwanted nuptials. Yet Eliza’s free spirit and understated sensuality stirs Michael’s desire. And Eliza discovers there is more to the arrogant lord than meets the eye, especially when she wonders if it is purely her writer’s imagination that puts his face behind a mysterious highwayman’s mask. Jude has come home to assume the responsibilities left to him upon his father’s death, and to finally end the marriage into which he was tricked. To his surprise, Anna is no longer an awkward, skinny girl with a furtive gaze. She has become a lush, enigmatic vixen with dark eyes that shield secrets she seems determined to keep. In their intimate war of wills, the heat of bold desire flares into passion—and casts light on a shared past tangled in lies and blackmail. But until Jude can win her trust and learn the truth, there will be no destroying the obstacles that loom darkly between them…and the love that should have been theirs. love it! love the pics (especially the one of you!) keep writing… would love to see a huge list of back covers here.